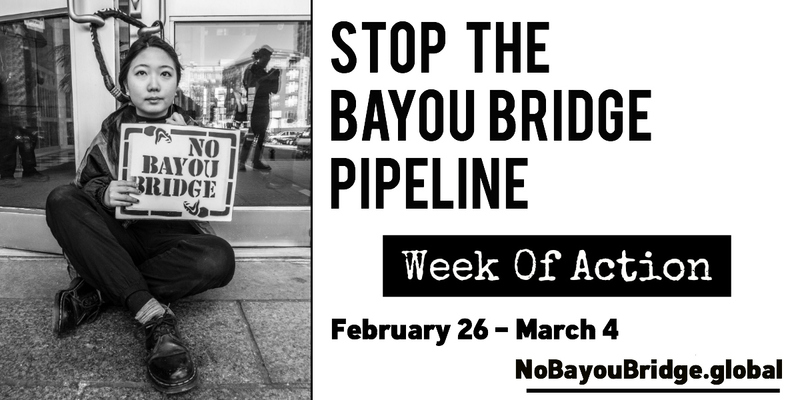 From February 26 - March 4, take action to stop the Bayou Bridge Pipeline. The Bayou Bridge Pipeline would cut across Southern Louisiana to bring fracked-oil from the Dakota Access Pipeline system to export facilities. Construction recently began on the pipeline, but frontline communities are resisting. The hub of this resistance is the L'eau Est La Vie Camp. The Bayou Bridge Pipeline is being proposed by Energy Transfer Partners (ETP), the company behind the Dakota Access Pipeline and other harmful projects across the continent. ETP is one of the most reckless corporations in the world and they must be held accountable. Organizers are calling for solidarity actions targeting the major financial institutions that are backing ETP. Visit NoBayouBridge.global to find a target near your community and organize a demonstration, vigil, letter delivery or a direct action. Please register your demonstration or action on this site if it is open to the public. For support organizing an action, please email us at actions@NoBayouBridge.global.